This is a preview of some work I’ve been doing recently. 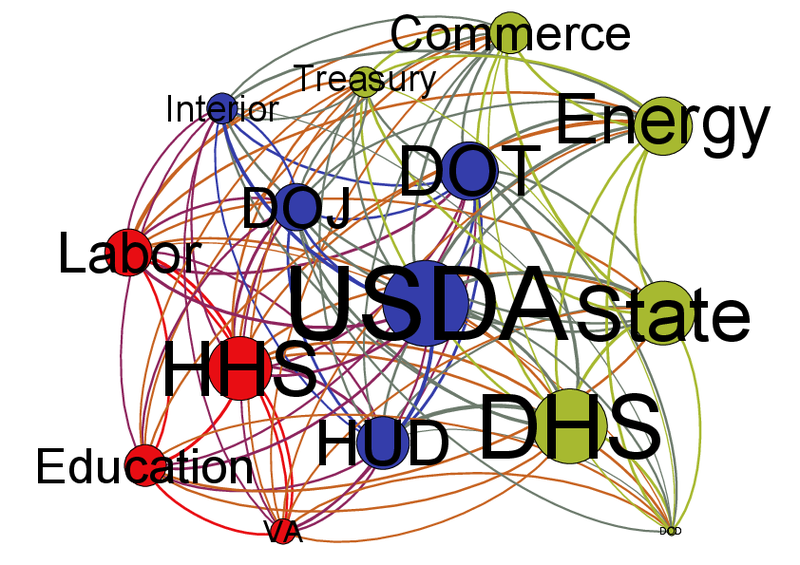 Using some multiplex relational information, I’ve assembled a network of the US federal government. After a bit of voodoo and some community detection algorithms, we see three communities within the federal cabinet. In the image below, node size is proportional to weighted degree, so more well-connected departments are larger. Colors correspond to communities, showing three distinct groups. We see a community of departments that focus more on providing citizen services (Labor, Education, HHS, VA), a community of departments with comparatively narrowly-defined regulatory concerns (USDA, DOI, DOJ, DOT, HUD), and a community of departments with very large budgets and perhaps a more international focus (State, DOD, DHS, Treasury, Commerce). 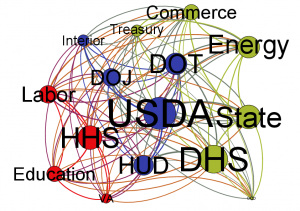 Interestingly, we see from its very small node size that the Department of Defense is much more weakly connected to executive-level departments than any of its peers. This perhaps speaks to the somewhat independent organization of the DOD with its large entrenched organization at the Pentagon supplementing its more traditional executive office.